Shock resistant steel. Hardened core for extra strength and reduced breakage. Snub nose design for ideal fitment. Quick, easy change-out in production use with S2 tool steel construction and a Rockwell Hardness between 58-62. Used in high torque applications; 1/4" hex drive. Tamper resistant Torx screws feature a post in the center of the recess; this post will only fit into a tamper resistant Torx bit. Used in applications such as control panels, display cases, high-tech equipment, security; 1/4" hex shank. Shock resistant steel. Hardened core for extra strength and reduced breakage. Snub nose design for ideal fitment. Shock resistant steel. Hardened core for extra strength and reduced breakage. Snub nose design for ideal fitment. Impact duty driver bits are engineered for extreme durability and long life. Made from proprietary steel and heat treated to control hardness. Designed for shock absorption to extend life. Forged tip allows for a secure grip and maximum contact eliminating stripping or slipping. Bosch Power Screwdriver Bit, T25 Point, Torx, T25 Point, 2 in Overall Length, Hexagonal Shank, 1/4 in Shank, Steel, Black Oxide, Impact Tough Hardness, For Impact Driver Positive tip geometry for best rotary drilling efficiency. All sizes 3/16" and larger have 3 flats on the shank so that the chuck gets a better grip on the bit. Wide spiral flutes efficiently remove dust and debris, from the cutting area. Used in applications such as drilling in damp masonry work, brick, cement, tile, slate and cinder block. Quick, easy change-out in production use with S2 tool steel construction and a Rockwell Hardness between 58-62. Used in high torque applications; 1/4" hex drive. Geometric design provides the shock absorption zone. Proprietary steel and heat treat process for maximum strength and durability. Forged tips for maximum grip. Geometric design provides the shock absorption zone. Proprietary steel and heat treat process for maximum strength and durability. Forged tips for maximum grip. Geometric design provides the shock absorption zone. Proprietary steel and heat treat process for maximum strength and durability. Forged tips for maximum grip. Extra hard Torx power bit, T27 point, 1/4 in. shank. Positive tip geometry for best rotary drilling efficiency. All sizes 3/16" and larger have 3 flats on the shank so that the chuck gets a better grip on the bit. Wide spiral flutes efficiently remove dust and debris, from the cutting area. Used in applications such as drilling in damp masonry work, brick, cement, tile, slate and cinder block. Dewalt Insert Bit, Series: FlexTorq, T20 Point, Torx Point, 2 in Overall Length, Hexagonal Shank, 1/4 in Shank, Magnetic Screw Locking, S2 Modified Steel, For Impact Drivers Dewalt Insert Bit, Series: FlexTorq, T25 Point, Torx Point, 2 in Overall Length, Hexagonal Shank, 1/4 in Shank, Magnetic Screw Locking, S2 Modified Steel, For Impact Drivers Positive tip geometry for best rotary drilling efficiency. All sizes 3/16" and larger have 3 flats on the shank so that the chuck gets a better grip on the bit. Wide spiral flutes efficiently remove dust and debris, from the cutting area. Used in applications such as drilling in damp masonry work, brick, cement, tile, slate and cinder block. Impact Ready accessories deliver exceptional performance for extreme torque applications. Flex Torq bits feature an extended Flex Torq zone to transfer optimal torque in hard joint applications, providing durability and longer life. The bit tip is CNC machined for a precise fit, reducing cam-out under torque. Magnetic screw lock sleeve minimizes drops and reduces wobbles. Impact ready bits can withstand up to 2000 in/lbs of torque. The perfect bit for high torque applications. Common in automotive, computer industries and other high torque applications; 1/4" hex shank. Single sided star bit tip. Pack of 2 (1" bits). Impact ready. Torx point type. Point size: T27. Overall length: 2". Positive tip geometry for best rotary drilling efficiency. All sizes 3/16" and larger have 3 flats on the shank so that the chuck gets a better grip on the bit. Wide spiral flutes efficiently remove dust and debris, from the cutting area. Used in applications such as drilling in damp masonry work, brick, cement, tile, slate and cinder block. Impact ready bits with Flex Torq have increased durability for long life. CNC machined resulting in accurate manufacturing for optimal fit into screw recess. Reflex core allows bits to flex up to 15 degrees to reduce breakage. Part of 10X magnetic screw lock system for fastener retention which minimizes drops and reduces wobbling. Impact ready bits can withstand up to 2000 in/lbs of torque. The perfect bit for high torque applications. Impact ready bits with Flex Torq have increased durability for long life. CNC machined resulting in accurate manufacturing for optimal fit into screw recess. Reflex core allows bits to flex up to 15 degrees to reduce breakage. Part of 10X magnetic screw lock system for fastener retention which minimizes drops and reduces wobbling. Impact ready bits can withstand up to 2000 in/lbs of torque. The perfect bit for high torque applications. Impact ready bits with Flex Torq have increased durability for long life. CNC machined resulting in accurate manufacturing for optimal fit into screw recess. Reflex core allows bits to flex up to 15 degrees to reduce breakage. Part of 10X magnetic screw lock system for fastener retention which minimizes drops and reduces wobbling. Impact ready bits can withstand up to 2000 in/lbs of torque. The perfect bit for high torque applications. Positive tip geometry for best rotary drilling efficiency. All sizes 3/16" and larger have 3 flats on the shank so that the chuck gets a better grip on the bit. Wide spiral flutes efficiently remove dust and debris, from the cutting area. Used in applications such as drilling in damp masonry work, brick, cement, tile, slate and cinder block. Tamper resistant Torx screws feature a post in the center of the recess; this post will only fit into a tamper resistant Torx bit. Used in applications such as control panels, display cases, high-tech equipment, security; 1/4" hex shank. Double sided star bit tip. Pack of 2 (2" bits). With a carbide split-point and aggressive flute angles for faster drilling speed. Dewalt multi-material drill bits deliver the power to easily drill through a range of materials without the need to change bits. A no-spin shank helps to increase efficiency by eliminating bit slippage. Carbide tip minimizes wear and extends the life of the bit. Used in applications such as drilling in brick, cinder block and tile. Tamper resistant Torx screws feature a post in the center of the recess; this post will only fit into a tamper resistant Torx bit. Used in applications such as control panels, display cases, high-tech equipment, security; 1/4" hex shank. Carbide tip minimizes wear and extends the life of the bit. Used in applications such as drilling in brick, cinder block and tile. High speed steel with four facet diamond ground carbide tip, for use with corded or cordless drills in multi material applications such as brick, block, ceramic tile, marble, wood, dry wall, gypsum board, limestone, slate, plastics/reinforced plastics, sheet metal, and cast iron. Can also be used in hammer drills. Upgraded multi-grind heads deliver up to 85 percent faster drilling in metal that standard bits. Hex shanks and impact rated allows user in impact drivers and hammer drill/drivers for added versatility. Sharp ground cutting edges designed for advanced performance. Steep flutes with ribs deliver fast material removal in multiple materials. Multi-application design offers drilling in masonry, brick, block, tile, metal, wood and plastic. Long life construction provides longer life than standard bits. No skate tip design allows for cleaner holes. High speed steel with four facet diamond ground carbide tip, for use with corded or cordless drills in multi material applications such as brick, block, ceramic tile, marble, wood, dry wall, gypsum board, limestone, slate, plastics/reinforced plastics, sheet metal, and cast iron. Can also be used in hammer drills. Positive tip geometry for best rotary drilling efficiency. All sizes 3/16" and larger have 3 flats on the shank so that the chuck gets a better grip on the bit. Wide spiral flutes efficiently remove dust and debris, from the cutting area. Used in applications such as drilling in damp masonry work, brick, cement, tile, slate and cinder block. High speed steel with four facet diamond ground carbide tip, for use with corded or cordless drills in multi material applications such as brick, block, ceramic tile, marble, wood, dry wall, gypsum board, limestone, slate, plastics/reinforced plastics, sheet metal, and cast iron. Can also be used in hammer drills. Upgraded multi-grind heads deliver up to 85 percent faster drilling in metal that standard bits. Hex shanks and impact rated allows user in impact drivers and hammer drill/drivers for added versatility. Sharp ground cutting edges designed for advanced performance. Steep flutes with ribs deliver fast material removal in multiple materials. Multi-application design offers drilling in masonry, brick, block, tile, metal, wood and plastic. Long life construction provides longer life than standard bits. No skate tip design allows for cleaner holes. Innovative flute design leading to faster material removal for easier drilling. Speed tip penetrates materials quickly. For use in impact drivers. 2 cutter heads. Impact ready. Percussion rates. Carbide tipped cutting edge material. Flute Length: 4". Overall Length: 6". Shank Size: 1/4". For tap con installation and brick block fastening. Forward cutting direction. For use with Pro Fit premium deck screws and other screws where a star drive bit is needed. 3 power bits per pack. Premium quality steel. Fits into a drill chuck or quick change adapter; 1/4" hex shank. For use with Pro Fit premium deck screws and other screws where a star drive bit is needed. 3 power bits per pack. Premium quality steel. Fits into a drill chuck or quick change adapter; 1/4" hex shank. For use with Pro Fit premium deck screws and other screws where a star drive bit is needed. 3 power bits per pack. Premium quality steel. Fits into a drill chuck or quick change adapter; 1/4" hex shank. For use with Pro Fit premium deck screws and other screws where a star drive bit is needed. 3 power bits per pack. Premium quality steel. Fits into a drill chuck or quick change adapter; 1/4" hex shank. Steep flute with ribs for optimal dust removal, softened shank for aggressive griping power and customized carbide geometry optimized to handle a variety of material. Can be used in rotary and impact mode in concrete without bit change; drills into many grades of tiles, from granite to porcelain. With a carbide split-point and aggressive flute angles for faster drilling speed. Dewalt multi-material drill bits deliver the power to easily drill through a range of materials without the need to change bits. A no-spin shank helps to increase efficiency by eliminating bit slippage. With a carbide split-point and aggressive flute angles for faster drilling speed. Dewalt multi-material drill bits deliver the power to easily drill through a range of materials without the need to change bits. A no-spin shank helps to increase efficiency by eliminating bit slippage. High speed steel with four facet diamond ground carbide tip, for use with corded or cordless drills in multi material applications such as brick, block, ceramic tile, marble, wood, dry wall, gypsum board, limestone, slate, plastics/reinforced plastics, sheet metal, and cast iron. Can also be used in hammer drills. Innovative pressed carbide tip with aggressive cutting angles for faster drilling and longer bit life. One piece construction withstands higher torque loads than standard quick-change bits. Black oxide finish resists corrosion and increases life of bit. 1/4" quick-change shank is designed to work with impact drivers and reduces slipping in standard drill chucks. Innovative pressed carbide tip with aggressive cutting angles for faster drilling and longer bit life. One piece construction withstands higher torque loads than standard quick-change bits. Black oxide finish resists corrosion and increases life of bit. 1/4" quick-change shank is designed to work with impact drivers and reduces slipping in standard drill chucks. With a carbide split-point and aggressive flute angles for faster drilling speed. Dewalt multi-material drill bits deliver the power to easily drill through a range of materials without the need to change bits. A no-spin shank helps to increase efficiency by eliminating bit slippage. Upgraded multi-grind heads deliver up to 85 percent faster drilling in metal that standard bits. Hex shanks and impact rated allows user in impact drivers and hammer drill/drivers for added versatility. Sharp ground cutting edges designed for advanced performance. Steep flutes with ribs deliver fast material removal in multiple materials. Multi-application design offers drilling in masonry, brick, block, tile, metal, wood and plastic. Long life construction provides longer life than standard bits. No skate tip design allows for cleaner holes. Innovative pressed carbide tip with aggressive cutting angles for faster drilling and longer bit life. One piece construction withstands higher torque loads than standard quick-change bits. Black oxide finish resists corrosion and increases life of bit. 1/4" quick-change shank is designed to work with impact drivers and reduces slipping in standard drill chucks. High speed steel with four facet diamond ground carbide tip, for use with corded or cordless drills in multi material applications such as brick, block, ceramic tile, marble, wood, dry wall, gypsum board, limestone, slate, plastics/reinforced plastics, sheet metal, and cast iron. Can also be used in hammer drills. For use in cordless and corded drills. For use to drill into brick, tile, block, wood, metal, plastic and marble. Carbide tipped bit with rapid load quick change used in applications such as drilling in brick, block and concrete; 1/4" universal hex shank prevents slipping. Innovative pressed carbide tip with aggressive cutting angles for faster drilling and longer bit life. One piece construction withstands higher torque loads than standard quick-change bits. Black oxide finish resists corrosion and increases life of bit. 1/4" quick-change shank is designed to work with impact drivers and reduces slipping in standard drill chucks. Innovative pressed carbide tip with aggressive cutting angles for faster drilling and longer bit life. One piece construction withstands higher torque loads than standard quick-change bits. Black oxide finish resists corrosion and increases life of bit. 1/4" quick-change shank is designed to work with impact drivers and reduces slipping in standard drill chucks. Built-in shoulder that sets automatic depth of drive for maximum holding power and prevents over-driving. Designed with higher shoulder for deeper penetration when installing grooved deck boards. #15 torx drive. Carbide tipped bit with rapid load quick change used in applications such as drilling in brick, block and concrete; 1/4" universal hex shank prevents slipping. Innovative pressed carbide tip with aggressive cutting angles for faster drilling and longer bit life. One piece construction withstands higher torque loads than standard quick-change bits. Black oxide finish resists corrosion and increases life of bit. 1/4" quick-change shank is designed to work with impact drivers and reduces slipping in standard drill chucks. Innovative flute design leading to faster material removal for easier drilling. Speed tip penetrates materials quickly. 1/4" hex shank for use in impact drivers. 2 cutter heads. Impact ready. Percussion rates. Carbide tipped cutting edge material. Flute Length: 4". Overall Length: 6". Shank Size: 1/4". For tap con installation and brick block fastening. Forward cutting direction. Innovative pressed carbide tip with aggressive cutting angles for faster drilling and longer bit life. One piece construction withstands higher torque loads than standard quick-change bits. Black oxide finish resists corrosion and increases life of bit. 1/4" quick-change shank is designed to work with impact drivers and reduces slipping in standard drill chucks. For use in cordless and corded drills. For use to drill into brick, tile, block, wood, metal, plastic and marble. 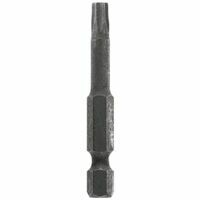 Carbide tipped bit with rapid load quick change used in applications such as drilling in brick, block and concrete; 1/4" universal hex shank prevents slipping. Common in automotive and computer industries; 1/4" hex drive. Includes: (1) one each: T15, T20 and T25. Nickel plated for fast, smooth performance. Carbide tip can be used for rotary drilling applications also for deep drilling. Slow spiral for quick and easy debris removal; 7/16" and larger drill bits have reduced shanks. For rotary or percussion drilling. Chrome vanadium steel shank with tungsten carbide/cobalt tip that is resharpenable, and able to withstand drilling temperatures up to 2,000 degrees Fahrenheit; no center punch needed. Use with cordless drills, corded drills and drill presses in applications such as masonry, ceramic tile, concrete, brick, fiberglass, plexiglass, glass, cast metals, hardened steel, granite, marble, woods, plastics. Not recommended for use on mild steel. This includes aluminum, angle iron, copper, galvanized pipe, brass and stainless steel. Innovative flute design leading to faster material removal for easier drilling. Speed tip penetrates materials quickly. 1/4" hex shank for use in impact drivers. 2 cutter heads. Impact ready. Percussion rated. Flute Length: 4". Overall Length: 6". Shank Size: 1/4". For tap con installation and brick block fastening. Forward cutting direction. For rotary or percussion drilling. Chrome vanadium steel shank with tungsten carbide/cobalt tip that is resharpenable, and able to withstand drilling temperatures up to 2,000 degrees Fahrenheit; no center punch needed. Use with cordless drills, corded drills and drill presses in applications such as masonry, ceramic tile, concrete, brick, fiberglass, plexiglass, glass, cast metals, hardened steel, granite, marble, woods, plastics. Not recommended for use on mild steel. This includes aluminum, angle iron, copper, galvanized pipe, brass and stainless steel. With a carbide split-point and aggressive flute angles for faster drilling speed. Dewalt multi-material drill bits deliver the power to easily drill through a range of materials without the need to change bits. A no-spin shank helps to increase efficiency by eliminating bit slippage. For rotary or percussion drilling. Chrome vanadium steel shank with tungsten carbide/cobalt tip that is resharpenable, and able to withstand drilling temperatures up to 2,000 degrees Fahrenheit; no center punch needed. Use with cordless drills, corded drills and drill presses in applications such as masonry, ceramic tile, concrete, brick, fiberglass, plexiglass, glass, cast metals, hardened steel, granite, marble, woods, plastics. Not recommended for use on mild steel. This includes aluminum, angle iron, copper, galvanized pipe, brass and stainless steel. Impact Tapcon installation bit. Built-in hex collar serves as a stop feature for drilling the perfect hole depth for Tapcon screws and other concrete screws. Drill/drive installation sleeve slides over bit and engages with hex collar to quickly drive hex or Phillips head fasteners. One-piece construction withstands higher torque loads than standard quick-change bits. 1/4" quick-change shank is designed to work with impact drivers and reduces slipping in standard drill chucks. Impact Tapcon installation bit. Built-in hex collar serves as a stop feature for drilling the perfect hole depth for Tapcon screws and other concrete screws. Drill/drive installation sleeve slides over bit and engages with hex collar to quickly drive hex or Phillips head fasteners. One-piece construction withstands higher torque loads than standard quick-change bits. 1/4" quick-change shank is designed to work with impact drivers and reduces slipping in standard drill chucks. For rotary or percussion drilling. Chrome vanadium steel shank with tungsten carbide/cobalt tip that is resharpenable, and able to withstand drilling temperatures up to 2,000 degrees Fahrenheit; no center punch needed. Use with cordless drills, corded drills and drill presses in applications such as masonry, ceramic tile, concrete, brick, fiberglass, plexiglass, glass, cast metals, hardened steel, granite, marble, woods, plastics. Not recommended for use on mild steel. This includes aluminum, angle iron, copper, galvanized pipe, brass and stainless steel. Geometric design provides the shock absorption zone. Proprietary steel and heat treat process for maximum strength and durability. Forged tips for maximum grip. Impact Tapcon installation bit. Built-in hex collar serves as a stop feature for drilling the perfect hole depth for Tapcon screws and other concrete screws. Drill/drive installation sleeve slides over bit and engages with hex collar to quickly drive hex or Phillips head fasteners. One-piece construction withstands higher torque loads than standard quick-change bits. 1/4" quick-change shank is designed to work with impact drivers and reduces slipping in standard drill chucks. Impact Tapcon installation bit. Built-in hex collar serves as a stop feature for drilling the perfect hole depth for Tapcon screws and other concrete screws. Drill/drive installation sleeve slides over bit and engages with hex collar to quickly drive hex or Phillips head fasteners. One-piece construction withstands higher torque loads than standard quick-change bits. 1/4" quick-change shank is designed to work with impact drivers and reduces slipping in standard drill chucks. Impact Tapcon installation bit. Built-in hex collar serves as a stop feature for drilling the perfect hole depth for Tapcon screws and other concrete screws. Drill/drive installation sleeve slides over bit and engages with hex collar to quickly drive hex or Phillips head fasteners. One-piece construction withstands higher torque loads than standard quick-change bits. 1/4" quick-change shank is designed to work with impact drivers and reduces slipping in standard drill chucks. Nickel plated for fast, smooth performance. Carbide tip can be used for rotary drilling applications also for deep drilling. Slow spiral for quick and easy debris removal; 7/16" and larger drill bits have reduced shanks. Upgraded multi-grind heads deliver up to 85 percent faster drilling in metal that standard bits. Hex shanks and impact rated allows user in impact drivers and hammer drill/drivers for added versatility. Sharp ground cutting edges designed for advanced performance. Steep flutes with ribs deliver fast material removal in multiple materials. Multi-application design offers drilling in masonry, brick, block, tile, metal, wood and plastic. Long life construction provides longer life than standard bits. No skate tip design allows for cleaner holes. For rotary or percussion drilling. Chrome vanadium steel shank with tungsten carbide/cobalt tip that is resharpenable, and able to withstand drilling temperatures up to 2,000 degrees Fahrenheit; no center punch needed. Use with cordless drills, corded drills and drill presses in applications such as masonry, ceramic tile, concrete, brick, fiberglass, plexiglass, glass, cast metals, hardened steel, granite, marble, woods, plastics. Not recommended for use on mild steel. This includes aluminum, angle iron, copper, galvanized pipe, brass and stainless steel. Positive tip geometry for best rotary drilling efficiency. All sizes 3/16" and larger have 3 flats on the shank so that the chuck gets a better grip on the bit. Wide spiral flutes efficiently remove dust and debris, from the cutting area. Used in applications such as drilling in damp masonry work, brick, cement, tile, slate and cinder block. For use in cordless and corded drills. For use to drill into brick, tile, block, wood, metal, plastic and marble. With a carbide split-point and aggressive flute angles for faster drilling speed. Dewalt multi-material drill bits deliver the power to easily drill through a range of materials without the need to change bits. A no-spin shank helps to increase efficiency by eliminating bit slippage. For rotary or percussion drilling. Chrome vanadium steel shank with tungsten carbide/cobalt tip that is resharpenable, and able to withstand drilling temperatures up to 2,000 degrees Fahrenheit; no center punch needed. Use with cordless drills, corded drills and drill presses in applications such as masonry, ceramic tile, concrete, brick, fiberglass, plexiglass, glass, cast metals, hardened steel, granite, marble, woods, plastics. Not recommended for use on mild steel. This includes aluminum, angle iron, copper, galvanized pipe, brass and stainless steel. For use in cordless and corded drills. For use to drill into brick, tile, block, wood, metal, plastic and marble. Upgraded multi-grind heads deliver up to 85 percent faster drilling in metal that standard bits. Hex shanks and impact rated allows user in impact drivers and hammer drill/drivers for added versatility. Sharp ground cutting edges designed for advanced performance. Steep flutes with ribs deliver fast material removal in multiple materials. Multi-application design offers drilling in masonry, brick, block, tile, metal, wood and plastic. Long life construction provides longer life than standard bits. No skate tip design allows for cleaner holes. For rotary or percussion drilling. Chrome vanadium steel shank with tungsten carbide/cobalt tip that is resharpenable, and able to withstand drilling temperatures up to 2,000 degrees Fahrenheit; no center punch needed. Use with cordless drills, corded drills and drill presses in applications such as masonry, ceramic tile, concrete, brick, fiberglass, plexiglass, glass, cast metals, hardened steel, granite, marble, woods, plastics. Not recommended for use on mild steel. This includes aluminum, angle iron, copper, galvanized pipe, brass and stainless steel. For use in cordless and corded drills. For use to drill into brick, tile, block, wood, metal, plastic and marble. Positive tip geometry for best rotary drilling efficiency. All sizes 3/16" and larger have 3 flats on the shank so that the chuck gets a better grip on the bit. Wide spiral flutes efficiently remove dust and debris, from the cutting area. Used in applications such as drilling in damp masonry work, brick, cement, tile, slate and cinder block. Impact insert bits. 1" (25.4 mm). Impact insert bits. 1" (25.4 mm). Positive tip geometry for best rotary drilling efficiency. All sizes 3/16" and larger have 3 flats on the shank so that the chuck gets a better grip on the bit. Wide spiral flutes efficiently remove dust and debris, from the cutting area. Used in applications such as drilling in damp masonry work, brick, cement, tile, slate and cinder block. For rotary or percussion drilling. Chrome vanadium steel shank with tungsten carbide/cobalt tip that is resharpenable, and able to withstand drilling temperatures up to 2,000 degrees Fahrenheit; no center punch needed. Use with cordless drills, corded drills and drill presses in applications such as masonry, ceramic tile, concrete, brick, fiberglass, plexiglass, glass, cast metals, hardened steel, granite, marble, woods, plastics. Not recommended for use on mild steel. This includes aluminum, angle iron, copper, galvanized pipe, brass and stainless steel. Nickel plated for fast, smooth performance. Carbide tip can be used for rotary drilling applications also for deep drilling. Slow spiral for quick and easy debris removal; 7/16" and larger drill bits have reduced shanks. For rotary or percussion drilling. Chrome vanadium steel shank with tungsten carbide/cobalt tip that is resharpenable, and able to withstand drilling temperatures up to 2,000 degrees Fahrenheit; no center punch needed. Use with cordless drills, corded drills and drill presses in applications such as masonry, ceramic tile, concrete, brick, fiberglass, plexiglass, glass, cast metals, hardened steel, granite, marble, woods, plastics. Not recommended for use on mild steel. This includes aluminum, angle iron, copper, galvanized pipe, brass and stainless steel. High quality S2 chrome molybdenum steel; 1/4" hex shank. High quality S2 chrome molybdenum steel; 1/4" hex shank. The Milwaukee 3-Flat Secure Grip hammer drill bit drills faster and lasts longer. Fits in all 1/2" three-jaw hammer drill chucks and maintains unyielding bit hold with heavy torsional loads. Designed especially for conical anchor, concrete screw, nail-in and hollow wall anchor applications. Reinforced flute geometry increases bit stability. Carbide tips extend performance in masonry applications. Set Includes: (1) 5/32" x 6" 3 Flat Secure Grip Hammer Drill Bit, (1) 3/16" x 6" 3-Flat Secure Grip Hammer Drill Bit and (1) 1/4" x 6" 3-Flat Secure Grip Hammer Drill Bit. Common in automotive, computer industries and other high torque applications; 1/4" hex shank. For rotary or percussion drilling. Chrome vanadium steel shank with tungsten carbide/cobalt tip that is resharpenable, and able to withstand drilling temperatures up to 2,000 degrees Fahrenheit; no center punch needed. Use with cordless drills, corded drills and drill presses in applications such as masonry, ceramic tile, concrete, brick, fiberglass, plexiglass, glass, cast metals, hardened steel, granite, marble, woods, plastics. Not recommended for use on mild steel. This includes aluminum, angle iron, copper, galvanized pipe, brass and stainless steel. High quality S2 chrome molybdenum steel; 1/4" hex shank. Common in automotive, computer industries and other high torque applications; 1/4" hex shank. Upgraded multi-grind heads deliver up to 85 percent faster drilling in metal that standard bits. Hex shanks and impact rated allows user in impact drivers and hammer drill/drivers for added versatility. Sharp ground cutting edges designed for advanced performance. Steep flutes with ribs deliver fast material removal in multiple materials. Multi-application design offers drilling in masonry, brick, block, tile, metal, wood and plastic. Long life construction provides longer life than standard bits. No skate tip design allows for cleaner holes. Nickel plated for fast, smooth performance. Carbide tip can be used for rotary drilling applications also for deep drilling. Slow spiral for quick and easy debris removal; 7/16" and larger drill bits have reduced shanks. Quick, easy change-out in production use with S2 tool steel construction and a Rockwell Hardness between 58-62. Used in high torque applications; 1/4" hex drive. Positive tip geometry for best rotary drilling efficiency. All sizes 3/16" and larger have 3 flats on the shank so that the chuck gets a better grip on the bit. Wide spiral flutes efficiently remove dust and debris, from the cutting area. Used in applications such as drilling in damp masonry work, brick, cement, tile, slate and cinder block. Quick, easy change-out in production use with S2 tool steel construction and a Rockwell Hardness between 58-62. Used in high torque applications; 1/4" hex drive. Common in automotive, computer industries and other high torque applications; 1/4" hex shank. Common in automotive, computer industries and other high torque applications; 1/4" hex shank. Common in automotive, computer industries and other high torque applications; 1/4" hex shank. High quality S2 chrome molybdenum steel; 1/4" hex shank. For rotary or percussion drilling. Chrome vanadium steel shank with tungsten carbide/cobalt tip that is resharpenable, and able to withstand drilling temperatures up to 2,000 degrees Fahrenheit; no center punch needed. Use with cordless drills, corded drills and drill presses in applications such as masonry, ceramic tile, concrete, brick, fiberglass, plexiglass, glass, cast metals, hardened steel, granite, marble, woods, plastics. Not recommended for use on mild steel. This includes aluminum, angle iron, copper, galvanized pipe, brass and stainless steel. Made from hardened steel. Blister Carded. Innovative flute design leading to faster material removal for easier drilling. 1/4" hex shank for use in impact drivers. Speed tip penetrates material quickly. Common in automotive, computer industries and other high torque applications; 1/4" hex shank. Nickel plated for fast, smooth performance. Carbide tip can be used for rotary drilling applications also for deep drilling. Slow spiral for quick and easy debris removal; 7/16" and larger drill bits have reduced shanks. Rock carbide tip maximizes carbide surface contact for longer bit life. Four flute design cleans debris out for fast, efficient drilling in applications such as drilling small diameter holes in masonry, concrete, rock, and artificial stone; three flats on shank eliminate bit slipping in chuck. Includes: 3/16"x3", 1/4"x4", 5/16"x6", and 3/8"x6". Positive tip geometry for best rotary drilling efficiency. All sizes 3/16" and larger have 3 flats on the shank so that the chuck gets a better grip on the bit. Wide spiral flutes efficiently remove dust and debris, from the cutting area. Used in applications such as drilling in damp masonry work, brick, cement, tile, slate and cinder block. Tamper resistant Torx screws feature a post in the center of the recess; this post will only fit into a tamper resistant Torx bit. Used in applications such as control panels, display cases, high-tech equipment, security; 1/4" hex shank. Tamper resistant Torx screws feature a post in the center of the recess; this post will only fit into a tamper resistant Torx bit. Used in applications such as control panels, display cases, high-tech equipment, security; 1/4" hex shank. Common in automotive, computer industries and other high torque applications; 1/4" hex shank. For rotary or percussion drilling. Chrome vanadium steel shank with tungsten carbide/cobalt tip that is resharpenable, and able to withstand drilling temperatures up to 2,000 degrees Fahrenheit; no center punch needed. Use with cordless drills, corded drills and drill presses in applications such as masonry, ceramic tile, concrete, brick, fiberglass, plexiglass, glass, cast metals, hardened steel, granite, marble, woods, plastics. Not recommended for use on mild steel. This includes aluminum, angle iron, copper, galvanized pipe, brass and stainless steel. Positive tip geometry for best rotary drilling efficiency. All sizes 3/16" and larger have 3 flats on the shank so that the chuck gets a better grip on the bit. Wide spiral flutes efficiently remove dust and debris, from the cutting area. Used in applications such as drilling in damp masonry work, brick, cement, tile, slate and cinder block. 25 piece insert bit with bit holder. 1" (25.4 mm). 25 piece insert bit with bit holder. 1" (25.4 mm). Nickel plated for fast, smooth performance. Carbide tip can be used for rotary drilling applications also for deep drilling. Slow spiral for quick and easy debris removal; 7/16" and larger drill bits have reduced shanks. For rotary or percussion drilling. Chrome vanadium steel shank with tungsten carbide/cobalt tip that is resharpenable, and able to withstand drilling temperatures up to 2,000 degrees Fahrenheit; no center punch needed. Use with cordless drills, corded drills and drill presses in applications such as masonry, ceramic tile, concrete, brick, fiberglass, plexiglass, glass, cast metals, hardened steel, granite, marble, woods, plastics. Not recommended for use on mild steel. This includes aluminum, angle iron, copper, galvanized pipe, brass and stainless steel. Robust head for longer life. Various useable lengths. Milled u-flutes with deep cut-spiral for fast dust removal. Diamond ground carbide tip for precise starts to avoid scratching and skating in tile and hard stone. PowerGrip shank for aggressive gripping power. Comes with a convenient pouch for easy storage. The set includes: (1) 5/32" x 2" x 3", (1) 3/16 x 4" x 6", (1) 1/4" x 4" x 6", (1) 5/16 x 4" x 6", (1) 3/8" x 4" x 6". Shock resistant steel. Hardened core for extra strength and reduced breakage. Snub nose design for ideal fitment. Designed to fit in all 1/2" three jaw hammer-drill chucks. Reduces the possibility of the bit spinning in the chuck during heavy torsional loads. Flute geometry provides dust and debris removal. Self-centering tip. Includes 5/32" x 6", 3/16" x 6", 1/4" x 6", 5/16" x 6" and 3/8" x 6". Rock Carbide bits with four flute carbide head that provides longer bit life with a special enlarged flute design that channels debris out of the hole for fast, efficient drilling into masonry, concrete, rock, and artificial stone. The bits in this set are intended to make holes for mechanical anchors. No-Spin Shank to eliminate bit slippage; used with 3/8" and 1/2" sized chucks. Includes: 3/16"x3", 1/4"x4", 5/16"x6", 3/8"x6", 1/2"x6" and (2) 1/4"x6". Bits feature aggressive diamond?ground tips for fast drilling, optimal flute design for fast dust removal and a shortened carbide tip that allows dust to move into the flute quickly reducing build up. Includes (1) one each: 5/32"x6", 3/16"x6", 1/4"x6", 3/8"x6", and 1/2"x6". Common in automotive, computer industries and other high torque applications; 1/4" hex shank. For rotary or percussion drilling. Chrome vanadium steel shank with tungsten carbide/cobalt tip that is resharpenable, and able to withstand drilling temperatures up to 2,000 degrees Fahrenheit; no center punch needed. Use with cordless drills, corded drills and drill presses in applications such as masonry, ceramic tile, concrete, brick, fiberglass, plexiglass, glass, cast metals, hardened steel, granite, marble, woods, plastics. Not recommended for use on mild steel. This includes aluminum, angle iron, copper, galvanized pipe, brass and stainless steel. Common in automotive, computer industries and other high torque applications; 1/4" hex shank. Carbide tipped for long life in tough applications. Bit runs cooler thanks to improved flute design. Centric tip ensures quick starts in concrete. Wear mark alerts user when tip wears beyond ANSO specification. Optimized brazing and hardening process for long life. Bosch-made carbide tips are tougher and more durable under heavy loads. Set includes: (1) 3/16" x 4" x 6", (1) 1/4" x 2" x 4", (1) 1/4" x 4" x 6", (1) 3/8" x 4" x 6" and (1) 1/2" x 4" x 6". Also includes a reusable rugged case. For rotary or percussion drilling. Chrome vanadium steel shank with cobalt and tungsten carbide tip that withstands temperatures up to 1900 degrees Fahrenheit. Special negative back grinding enables tip to bore through applications such as masonry, ceramic tile, concrete, brick, fiberglass, plexiglass, cast metals, hardened steel, granite, marble, woods, and plastic with a filing action rather than a cutting action. No center punch required; eliminates walking and can be re-sharpened. NOTE: Not recommended for use on mild steel. This includes aluminum, angle iron, copper, galvanized pipe, brass and stainless steel. The double flute drills fast while carbide tip minimizes wear and extends the life of the bit. Used in applications such as drilling in brick, cinder block and tile with corded or cordless rotary drills. Use to power through masonry, concrete, rock, and more with DEWALT Hammer Drill Bits. Featuring rock carbide tips that maximize surface contact for extended bit life and a four flute design that cleans debris while you work. Three flats on the shank eliminate bit slippage. Two cutter carbide tip maximizes carbide surface contact for longer bit life. Includes: 3/16", 1/4", 5/16", 3/8", and 1/4" bits. For rotary or percussion drilling. Chrome vanadium steel shank with cobalt and tungsten carbide tip that withstands temperatures up to 1900 degrees Fahrenheit. Special negative back grinding enables tip to bore through applications such as masonry, ceramic tile, concrete, brick, fiberglass, plexiglass, cast metals, hardened steel, granite, marble, woods, and plastic with a filing action rather than a cutting action. No center punch required; eliminates walking and can be re-sharpened. NOTE: Not recommended for use on mild steel. This includes aluminum, angle iron, copper, galvanized pipe, brass and stainless steel. For rotary or percussion drilling. Chrome vanadium steel shank with cobalt and tungsten carbide tip that withstands temperatures up to 1900 degrees Fahrenheit. Special negative back grinding enables tip to bore through applications such as masonry, ceramic tile, concrete, brick, fiberglass, plexiglass, cast metals, hardened steel, granite, marble, woods, and plastic with a filing action rather than a cutting action. No center punch required; eliminates walking and can be re-sharpened. NOTE: Not recommended for use on mild steel. This includes aluminum, angle iron, copper, galvanized pipe, brass and stainless steel. Chisel shaped tip breaks concrete quickly for faster penetration. Four fluted spiral shaft has dust removal. Includes 3/16" x 4-1/2", 1/4" x 6", 5/16" x 6", 3/8" x 6", and 1/2" x 6". The 3-flat secure grip shank fits in all 1/2" three-jaw hammer drill chucks and maintains unyielding bit hold with heavy torsional loads. Designed especially for conical anchor, concrete screw, nail-in and hollow wall anchor applications. The bit provides superior performance through it reinforced flute geometry and carbide tip design. Delivers ideal quality in a select range of bits. Set includes: (1) 5/32" x 6" 3-flat secure grip hammer drill bit, (2) 3/16" x 6" 3-Flat Secure Grip hammer drill bit, (2) 1/4" x 6" 3-Flat Secure-Grip Hammer drill bit, (1) 5/16" x 6" 3-Flat Secure-Grip Hammer drill bit and (1) 3/8" x 6" 3-Flat Secure Grip Hammer drill bit. Carbide tipped for long life in tough applications. Centric tip ensures quick starts in concrete. Optimized brazing and hardening process for long life. Wear mark alerts user when tip wears beyond ANSO specification. Bit runs cooler thanks to improved flute design. Brute Tough storage case for easy access, organizing and portability. The set includes: (1) 5/32" x 4" x 6", (1) 3/16" x 4" x 6", (1) 1/4" x 2" x 4", (1) 3/8" x 4" x 6", (1) flat chisel and (1) point chisel. Rock carbide tip for longer bit life and a 4 flute design that cleans debris out for fast, efficient drilling in concrete, masonry, artificial stone, and rock; fits into standard 3/8" and 1/2" chucks. Includes 3/16"x6-1/2", 1/4"x4", 1/4"x6", 3/8"x6", 1/2"x6" bits and case. For rotary or percussion drilling. Chrome vanadium steel shank with cobalt and tungsten carbide tip that withstands temperatures up to 1900 degrees Fahrenheit. Special negative back grinding enables tip to bore through applications such as masonry, ceramic tile, concrete, brick, fiberglass, plexiglass, cast metals, hardened steel, granite, marble, woods, and plastic with a filing action rather than a cutting action. No center punch required; eliminates walking and can be re-sharpened. NOTE: Not recommended for use on mild steel. This includes aluminum, angle iron, copper, galvanized pipe, brass and stainless steel. For rotary or percussion drilling. Chrome vanadium steel shank with cobalt and tungsten carbide tip that withstands temperatures up to 1900 degrees Fahrenheit. Special negative back grinding enables tip to bore through applications such as masonry, ceramic tile, concrete, brick, fiberglass, plexiglass, cast metals, hardened steel, granite, marble, woods, and plastic with a filing action rather than a cutting action. No center punch required; eliminates walking and can be re-sharpened. NOTE: Not recommended for use on mild steel. This includes aluminum, angle iron, copper, galvanized pipe, brass and stainless steel. For rotary or percussion drilling. Chrome vanadium steel shank with tungsten carbide/cobalt tip that is resharpenable, and able to withstand drilling temperatures up to 2,000 degrees Fahrenheit; no center punch needed. Use with cordless drills, corded drills and drill presses in applications such as masonry, ceramic tile, concrete, brick, fiberglass, plexiglass, glass, cast metals, hardened steel, granite, marble, woods, plastics. Not recommended for use on mild steel. This includes aluminum, angle iron, copper, galvanized pipe, brass and stainless steel. For rotary or percussion drilling. Chrome vanadium steel shank with cobalt and tungsten carbide tip that withstands temperatures up to 1900 degrees Fahrenheit. Special negative back grinding enables tip to bore through applications such as masonry, ceramic tile, concrete, brick, fiberglass, plexiglass, cast metals, hardened steel, granite, marble, woods, and plastic with a filing action rather than a cutting action. No center punch required; eliminates walking and can be re-sharpened. NOTE: Not recommended for use on mild steel. This includes aluminum, angle iron, copper, galvanized pipe, brass and stainless steel. For rotary or percussion drilling. Chrome vanadium steel shank with cobalt and tungsten carbide tip that withstands temperatures up to 1900 degrees Fahrenheit. Special negative back grinding enables tip to bore through applications such as masonry, ceramic tile, concrete, brick, fiberglass, plexiglass, cast metals, hardened steel, granite, marble, woods, and plastic with a filing action rather than a cutting action. No center punch required; eliminates walking and can be re-sharpened. NOTE: Not recommended for use on mild steel. This includes aluminum, angle iron, copper, galvanized pipe, brass and stainless steel.